By far the most lovable companion one can find in the middle of a garbage heap. Chii's story is a journey with humble beginnings - unknown origins, a conspicuous lack of clothes and a vocabulary limited to one word only - "chii". She resembles others of her kind - highly intelligent robots called persocoms, only in her striking beauty. However, no other persocon can match the innocence in her eyes or her thirst for new knowledge. Initially, Chii behaves similar to a small child. She is much more a kid demanding constant attention than a valuable commodity. However, over time, her caring and warm character reveals itself, making it impossible for those she meets not to fall in love with her. Which might be as much a blessing as a curse. No matter how humanlike in appearance, Chii is still a machine. Can she really feel love and compassion, or are those merely parts of her program? Is her innocence a trap designed to cause pain to those who come too close to her? 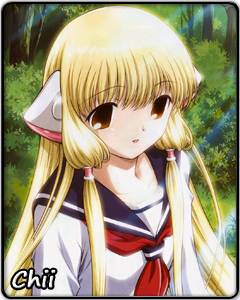 Lying asleep at night, Chii sees her reflection urging her to find a "person only for her". Are those really her dreams, or is there someone secretly guiding her along from the shadows? The answers lie in the blurry line between computer code and a true soul.